All my friends love them too! I love what you are doing and just know that it makes me super happy to be able to write to my family and friends with your lovely letters! I’ve been fortunate enough to acquire some of the handmade cards to send home to my friends and family. What a great project and hope you know that your efforts and support is making a difference over here. 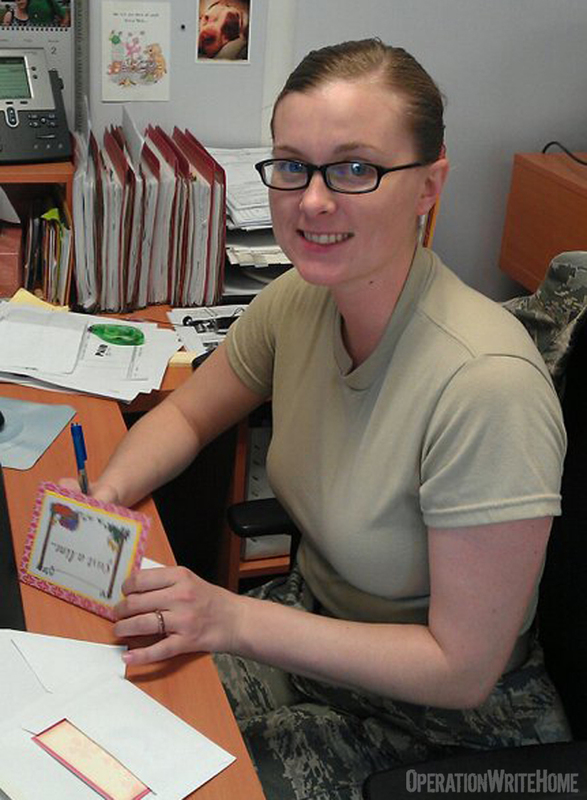 During my husbands last deployment I received 0 handwritten letters from him. I mentioned how much I'd like one, but I just kept receiving emails, which are good, but it's just not the same. We are two months in to his current deployment and I've received two love letters on your cards! He spotted them at the chapel and decided to send one my way. It has really lifted my spirits and helps keep me going through this difficult time. Thank you thank you thank you for supporting our service members and their families. I just received another box and wanted to thank you for your support. These boxes are a big hit here in Al Asad, Iraq. I have lots of soldiers, sailors, Army, Navy, Air Force who go through it and use them up. Things are going well here. I'm on my 11th month and have 4 more to go. I just wanted you to know that I received the box of cards the other day. 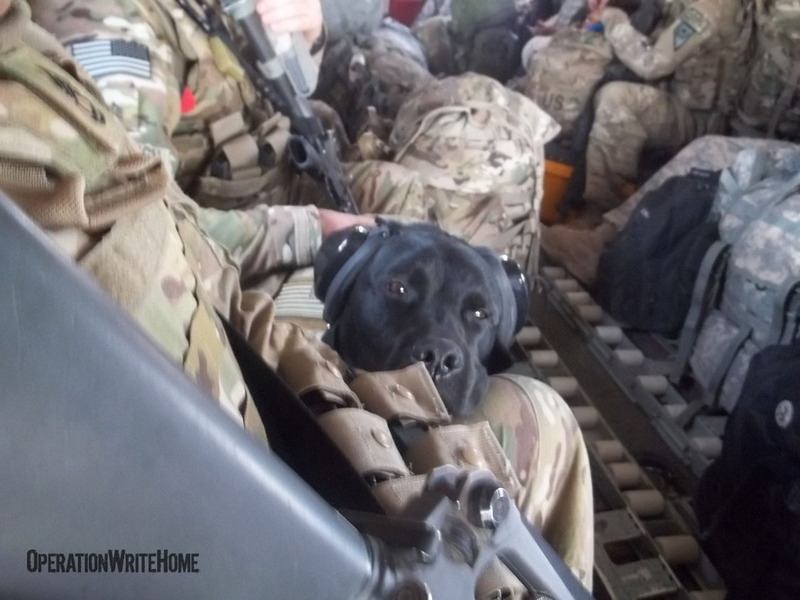 They always bring a smile to the faces of the Soldiers here. 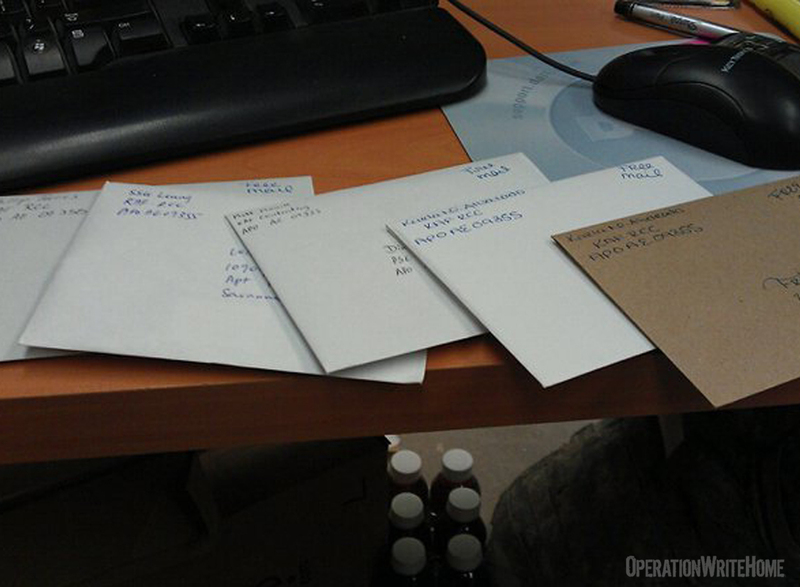 The Soldiers are always amazed that the cards are handmade. Congratulations on Ciara's enlistment into the US Army. That was really a great and exciting time for you all there at Operation Write Home. Well once again thank you for the great work that you all do. I will talk to you later. What a wonderful treat to receive the box of note cards for my company, coming from Operation Write Home. This gift that you and many others have given will brighten the lives of our soldiers. What talent your group has! I can't believe how beautiful and charming the note cards are. I don't believe there are enough words to express my gratitude. Thank you again, and again, and again. Even with modern technology, I as well, believe writing letters home is important. I know how special it makes me feel to receive mail. I had asked my husband to send me some stationary, but he had no idea what I was wanting. These cards are perfect! Currently, our company has been split between 2 different posts. Last night I divided the cards, and I will keep 1/2 here (Bagram) and send the other 1/2 to Gamberi. 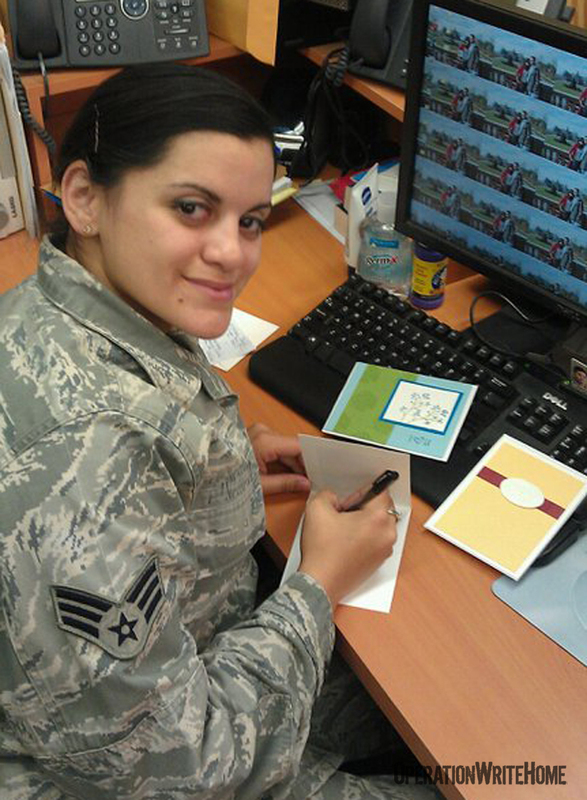 I so wish I could be there to see the faces of the soldiers who receive these cards. Just know you will touch each and every one of their lives. After sending us these beautiful cards, it seems inappropriate to email you our gratitude. I know it takes a few weeks to get letters back to the USA, and I wanted you to know they had been received. I will follow-up this letter with a handwritten one. Again, thank you Dixie. I can't believe a caring, thoughtful woman like yourself could possibly get into trouble if she had too much free time on her hands. 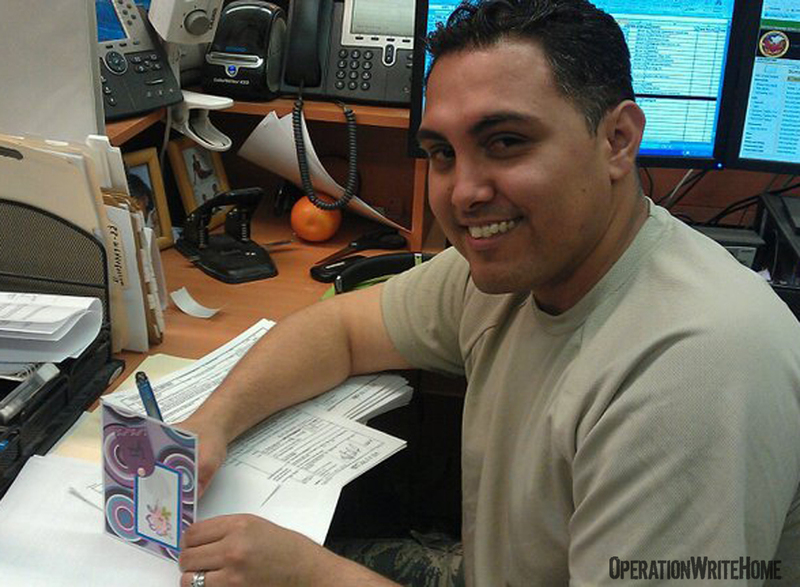 We are blessed that you chose to fill your time supporting the troops. You're a gift from heaven. Also, thank you for the picture of the deer. I have it posted on my wall here at work. It's nice to see wildlife, especially when in a war-torn country. This is a reminder of home, and I will be back there next April. It touches my heart every time our platoon gets a box of cards from you. Thank you so much! How are you? I hope all is well with you! Ciara is a beautiful dog, and no, napping is not considered much in the Army but she can still be a great golden soldier dog anyway, LOL! I appreciate your thanks and blessings; please continue to pray for us all out here and staying strong for us on the homefront. You all take care and God bless! I can't thank you enough for the cards. I especially love them because I am a scrapbooking maniac and it makes me feel like I am sending a little piece of myself home every time I mail one to my family, it's great. Anyways, I just wanted to express my sincere gratitude for what you do. It really is amazing, thank you. Thank you so much for your generosity! My unit will be very pleased to receive such a gift. We appreciate this extra task that you have taken on, and the care you put forth to the service members of our great Country! Yes, this is a correct address. The largest majority of my battalion has moved on to another FOB; however, someone comes to see us regularly and I will make sure the cards get there. I am so excited to get these! 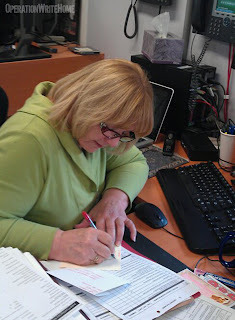 To get mail here in theatre is a wonderful thing, but to share our thoughts with our family in writing, is as special. Modern technology allows us to communicate via the internet, but the time taken to write a personal letter leaves a lasting memory. Thank you again for allowing all of us this opportunity. Hi there I just received a letter from a friend overseas and I noticed the stamp on the back so I checked out your website. 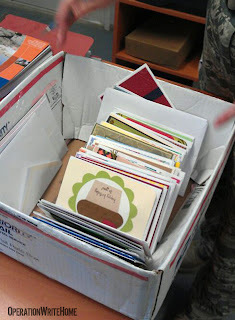 I just wanted to say thanks for sending our troops cards. I send carepackadges when i can. Thank you for supporting the troops!!!!!! I just wanted to take a moment to say thank you for the cards you made for the soldiers. I received one of them from my husband today and it really lifted my spirits. It's a beautiful card and what a great way to give back to the soldiers. Thank you for the support, time, effort and creativity. While re-reading some of my mail from my daughter while she was in Iraq, I turned the card around and saw that you had furnished the card, Operation Write Home. It made me happy and so thankful that people like you take the time and your resources to help out our troops. My daughter had been deployed twice. First in 03-04 for 14 months with the Tenn National Guard and then last year. I cannot tell you how gratetful I am to have my girl home safe and sound. 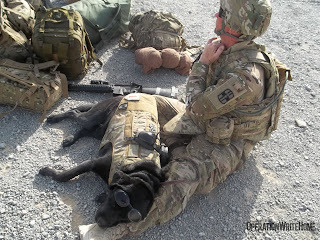 She is a full time Guard soldier. Forgive my mistakes, I am of German origin and my english is not the best. We are a military family. My husband was an AirForce SGT and he passed away due to exposure while in Vietnam. Again my deepest thanks for your kindness and my God bless you and your family. I would like to extend a hearty thank you to all who contributed for the great cards we received.Thank you for all you do. Thanks again for the thoughtful, beautifully crafted cards. 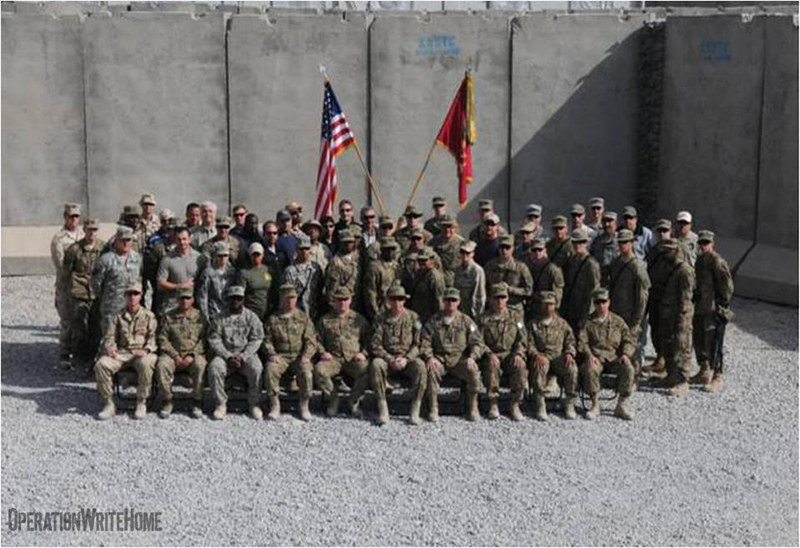 Just wanted to drop you a line from Camp Leatherneck, Afghanistan! Thank you very much for the package from Operation Write Home. I have already put them to use for my beautiful wife Jenny! I cannot thank you enough for my box full of wonderful cards! I love them! I really enjoy writing and sending things home to friends, family, and great supporters. I will most definitely put good use to these beautiful cards. These will be perfect for now. I am here til next year. Ciara is a gorgeous mascot! I think the honorary soldier will be perfect for her! Again, thanks a bunch for all you do. I can't thank you enough! Thank you and your staff for developing Operation Write Home. There is nothing more wonderful than receiving a card in the mail or sending one to a loved one. I greatly appreciate what you have and are doing for us. It is the second best thing to come from Washington - the first was my USMC buddy who is from Tacoma. Keep up the great work and thanks for your service! Sorry I haven't written yet, our team has been really busy. We just got done with a mission the other day, it lasted about 15 days. I just got back from my R&R leave at the beginning of June so I was home for Memorial Weekend which was nice, except for the weather. I am part of a 12-man Operational Mentor and Liaison Team (OMLT). We are the 4th team from Minnesota to do this mission. 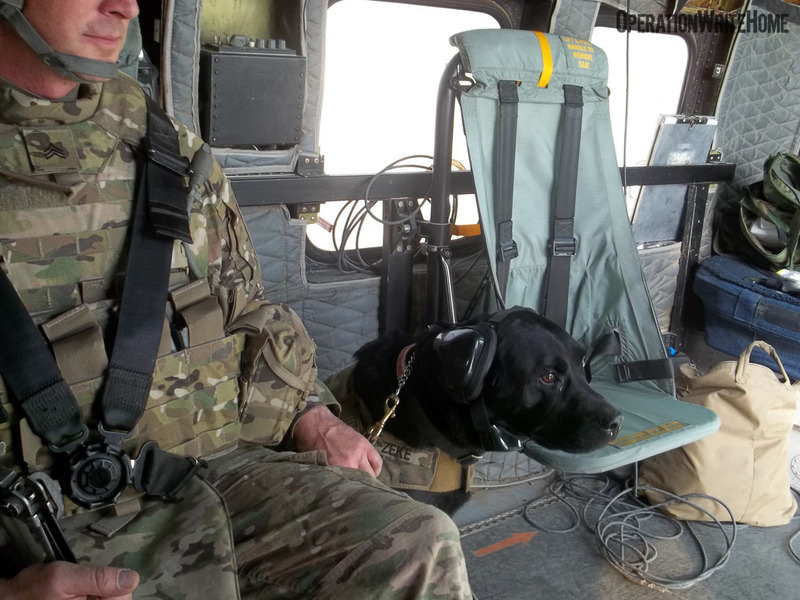 We help the Afghan National Army with training and whatnot. If you go on to the Minnesota National Guard website there are pictures of us out there on missions that we have done. The team really appreciates the cards and letters, and the ones we don't use I give to the chaplain for hte rest of the soldiers on base. 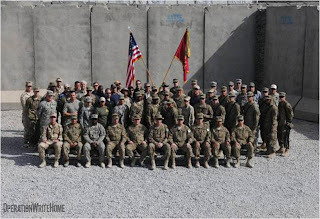 On behalf of everyone here in my Unit on Kandahar Air Base I just want to say thank you. Everyone was very impressed by the quality and effort that everyone put into the cards. The cards were a big hit! Attached are some pictures of our troops writing letters home. That box went fast! Thanks again for the support! I also want to thank you for your support to my units. It has been appreciated more than you can imagine. 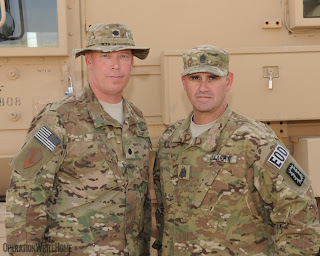 I’ve attached a picture of my unit and myself with my CSM.